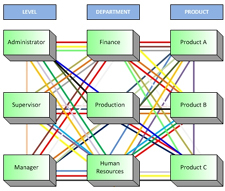 Functional structure is set up so that each portion of the organization is grouped according to its purpose. In this type of organization, for example, there may be a marketing department, a sales department and a production department. The functional structure works very well for small businesses in which each department can rely on the talent and knowledge of its workers and support itself. However, one of the drawbacks to a functional structure is that the coordination and communication between departments can be restricted by the organizational boundaries of having the various departments working separately. Divisional structure typically is used in larger companies that operate in a wide geographic area or that have separate smaller organizations within the umbrella group to cover different types of products or market areas. For example, the now-defunct Tecumseh Products Company was organized divisionally – with a small engine division, a compressor division, a parts division and divisions for each geographic area to handle specific needs. The benefit of this structure is that needs can be met more rapidly and more specifically; however, communication is inhibited because employees in different divisions are not working together. Divisional structure is costly because of its size and scope. Small businesses can use a divisional structure on a smaller scale, having different offices in different parts of the city, for example, or assigning different sales teams to handle different geographic areas. Small Business Chron, Different Types of Organizational Structure, at http://smallbusiness.chron.com/different-types-organizational-structure-723.html, accessed 19 January 2017. Page created by: Ian Clark, last modified on 19 January 2017. Image: Learn Management2, at http://www.learnmanagement2.com/matrix%20structure.htm, accessed 19 January 2017.